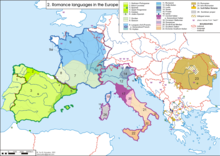 Vulgar Latin developed into Romance languages, 6th to 9th centuries; the formal language continued as the scholarly lingua franca of medieval Western Europe and as the liturgical language of the Roman Catholic Church. "Latin Dictionary Headword Search"। Perseus Hopper। Tufts University। Searches Lewis & Short's A Latin Dictionary and Lewis's An Elementary Latin Dictionary. Online results. "Latin Word Study Tool"। Perseus Hopper। Tufts University। Identifies the grammatical functions of words entered. Online results. Aversa, Alan। "Latin Inflector"। University of Arizona। Identifies the grammatical functions of all the words in sentences entered, using Perseus. Hatfield, Brent (২০১০)। "Learn Latin Online Free"। Free online Latin course utilizing youtube videos and downloadable worksheets। Brent Hatfield। সংগ্রহের তারিখ ২ সেপ্টেম্বর ২০১০। No longer active.